I haven't written a blog in a few days because I've been working on the projects for the upcoming Ben Franklin Craft club newsletter. (Craft club members receive three newletters per year in the mail.) 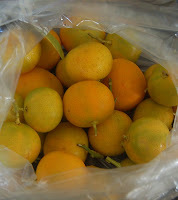 I took a break from the newsletter today because a neighbor, (Laura-the-gardener) gave us a bag of round mini limes(?). They were orange inside and very juicy so I decided to make lemon curd with them. I am posting a photo of the fruit, the recipe, and a photo of how I decorated the curd for giving (one for Laura, of course). 1. Place all the ingredients in a saucepan over medium heat. 2. Stirring constantly, cook the mixture until it becomes thick. 3. Add the butter in slowly until the curd is smooth. 4. Ladle the curd into two small jars and refrigerate them. To decorate a jar for autumn, tear a piece of thick, natural-colored washi paper into a circle to fit over the jar cover. Tie the washi paper onto the jar with paper raffia and add sprigs of berries and fall leaves snipped from an artificial branch. For the Christmas decorated jar, invert a muffin paper liner (Wilton Christmas themed) over the jar cover. Use cord to secure the muffin liner to the jar and clip on a gift tag with a mini Christmas clothespin (Xutai). Here is a photo of the magnificent 10 foot (or maybe 12') Christmas tree on display at the Hilo Ben Franklin Craft store. Isn't it deliciously appealing? The edible-looking ornaments are light-weight and glittery. Hurry to the store to get some ornament treats for your home. I promised myself and my family that I wouldn't buy more Christmas decorations this year. Afterall, my two boys are too old to care what the house looks like during the holidays. However, as soon as I saw the gigantic dessert tree at the Hilo Ben Franklin Crafts, I forgot my promise. The crew who decorated the enormous tree with garlands of cupcakes and assorted sugared treats deserve an award. It has to be the most beautiful Christmas tree in Hawaii. In fact, the store has had several requests to supply decorated trees to offices in Hilo. I will try to take a picture of the tree to post on this blog. I especially love the way the cupcake garlands were draped vertically instead of winding them around the tree, which is the usual decorating technique. The photo shown here is a instant decoration I made using only three Christmas picks and a tall glass vase (or maybe it's a drinking glass) I had from last Valentine's Day. I wrapped some irridescent tissue around the extra long picks and wedged them into the glass vase. If you can't find the vase at Ben Franklin Crafts, you can use any tall, thin vase and wire wrap red glass beads onto the stem. This decoration would make a great table centerpiece at a Christmas party or something different to give to a hostess instead of flowers. Today I wanted to just pop into Ben Franklin Crafts to find a snowflake crystal or sterling snowflake charm to add to my winter bracelet. I didn't find snowflakes, but I did shop for two hours! I bought some great stuff which I will write about in the next newsletter. To insure that you don't miss out on some of the seasonal goodies, you need to start checking out all the new items arriving daily. For Halloween (quickly becoming a favorite celebration for young and old alike) I discovered new Halloween rubber stamps (both wooden handled and clear). I have some super ideas for using these cute rubber stamps on cards and treat holders. Hero Arts also had a Thanksgiving clear stamp set with words and holiday images. I was surprised and delighted to find mini clear stamp sets with rhinestone embellishments to add to stamped items. Besides stamps I bought lots of bead strands by Imagine It because there were new shapes called sticks and the price was reasonable enough to start me planning jewelry Christmas gifts for all the ladies on my list. It's not too soon to start thinking about decorating for the coming fall and winter seasons and you're sure to find something beautiful at Ben Franklin Crafts. As for the bracelet, I think I'll use stars or perhaps change it to a snowball bracelet or make a snowflake from crystals and sterling wire. I'll show you the results if it's a success. Today is my oldest son's birthday so I thought it would be appropriate to show you the card/scrapbook page that I sent him. I have trouble keeping my scrapbook current (I'm actually years behind.....a decade in the case of some photos) so a few years ago I started making combination scrapbook pages and greeting cards for my family. I work in an 8"x 8" format because that seems just big enough to fit my sentiments and a photo or two of the event. This pa st weekend we had the pleasure of attending the wedding of a friend's daughter. I wanted to make a special card, one that the bride might keep. I had a package of the current K and Co. wedding stickers and an idea to make a hanging tag card that could be used as a home decoration or an embellishment for a wedding album page. There are so many beautiful scrapbook papers that it wasn't hard to find two complimentary ones in pink (the color of the invitation)with a little sparkle and a slight Asian influence (also seen on the invitation). Anyway, after making a tag shape out of cardoard (I traced one from a K and Co. kit), I used Merikan tape to adhere the scrapbook paper (also cut in the tag shape). 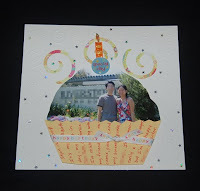 Next, the cake sticker was altered (I cut off the top tier)so that it woul d fit the tag along with the frame sticker. The frame sticker came from an old K and Co. package but it could easily be made using decorative edge scissors and rectangle punches. The bride can later put a personal photo into the frame sticker. The ribbon was enhanced by gluing on a second ribbon but you may be able to find one that already has colors, which match the papers. With Fabric Tac glue I covered the tag edge with a ribbon trim. In the back of the tag I attached a glassine envelope to enclose a gift and a few words to the bride and groom. Later the bride can put her journaling in the envelope. To coordinate the whole card, I lined the envelope with the same paper used on the back of the tag. I hope the couple enjoys the tag card as much as I enjoyed creating it. My family will attest to the fact that I have a definite crafting disorder. My brain seems to work non-stop on craft projects and I can't throw away anything with craft potential. Recently, while trying to discard some old craft magazines, I gave them a last thumb through and saw an interesting use for metal containers like baking powder, spice tins, cocoa powder, etc. I save lots of tins with covers because of their attractive graphic designs but never really put them to good use. This old craft project showed how to turn tins with covers into candles. This was a perfect use for my tins especially because I recently learned that a lit candle is good for burning off the chemicals released from a onion that make you cry when slicing it. Having a food related candle filled tin in the kitchen made sense and would be attractive. I bought the candle wax (beeswax), wicks, color, and scent from Ben Franklin Crafts. I intended to make the candles by melting the wax in a can placed in a pot of boiling water, but my husband bought (while traveling) some soy wax that was microwaveable. Hopefully, we will soon have this soy wax in Ben Franklin Crafts. Anyway, using whatever kind of wax you purchase, you can easily make lots of clever gifts and craft fair items to sell. I even made a Spam Lite candle for my Spam-loving son who hopefully, will appreciate the humor. See photo.